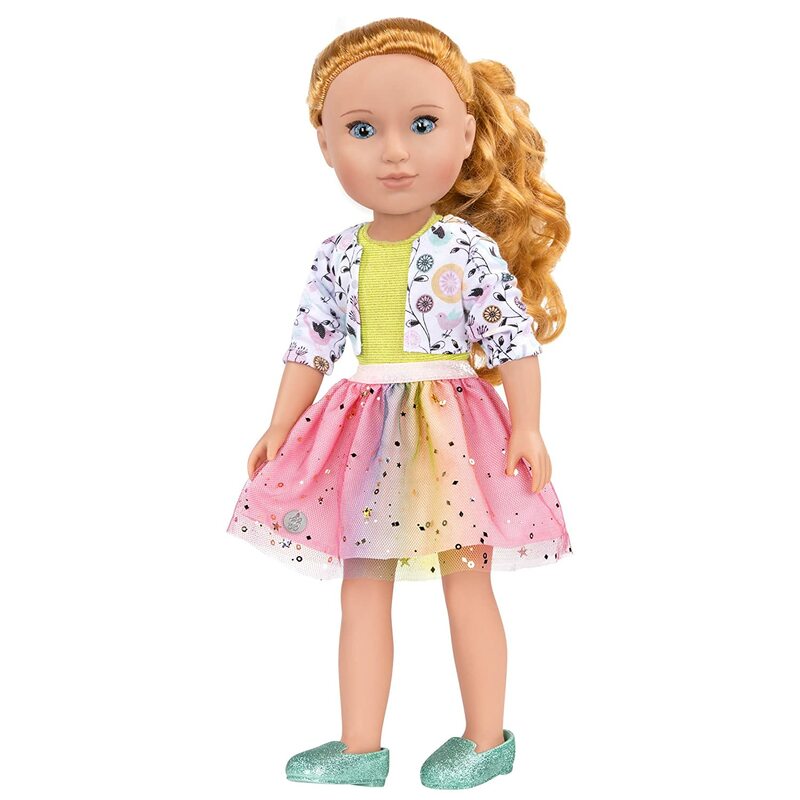 Trendy clothes: this stylish and glittery 14-inch doll outfit comes with a cute white skirt with glitter, a teal top with sparkly heart applique, a pair of knee-high socks and a pair of glittery sandals. 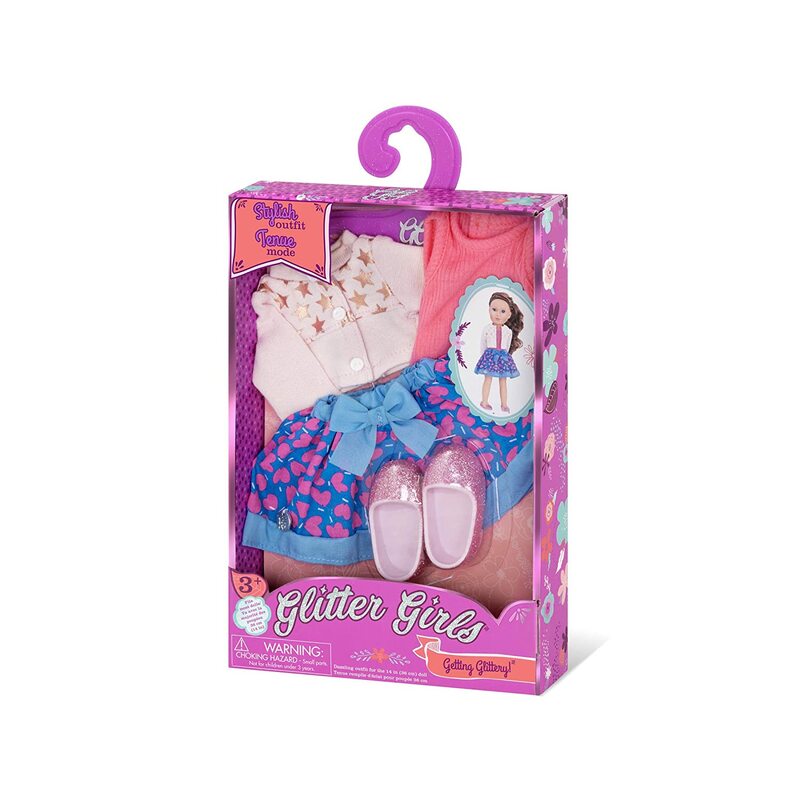 Collect them all: glitter girls outfits provide hours of dress-up pretend play and fun. Your little girl will love them! 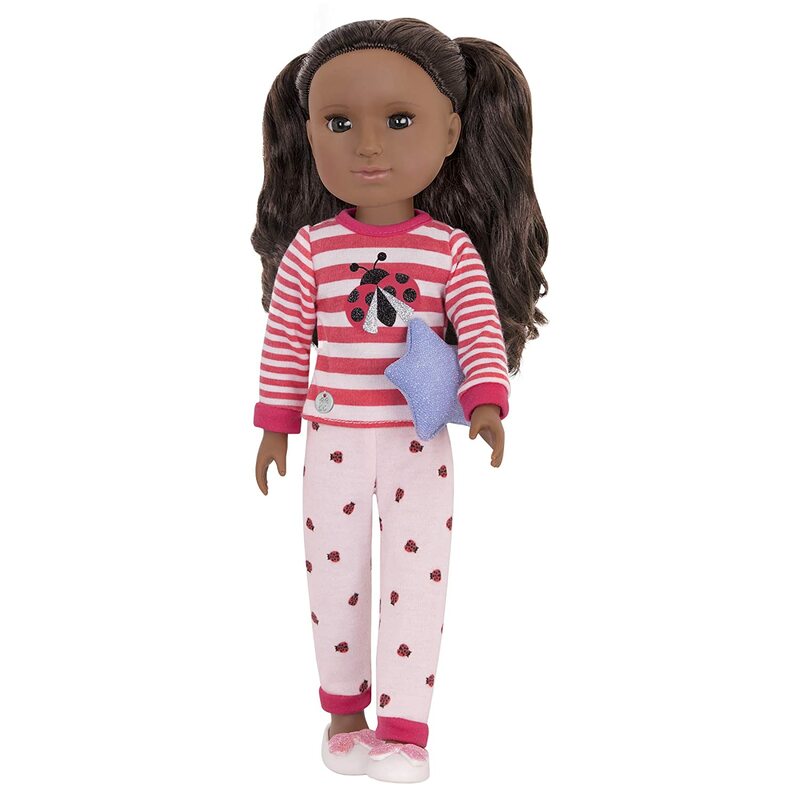 paired with our 14-inch dolls and fun accessories, they make a great gift! collect all of your favorite glitter girls dolls, outfits, and accessories (including the equestrian collection with 14" horses and stable)! 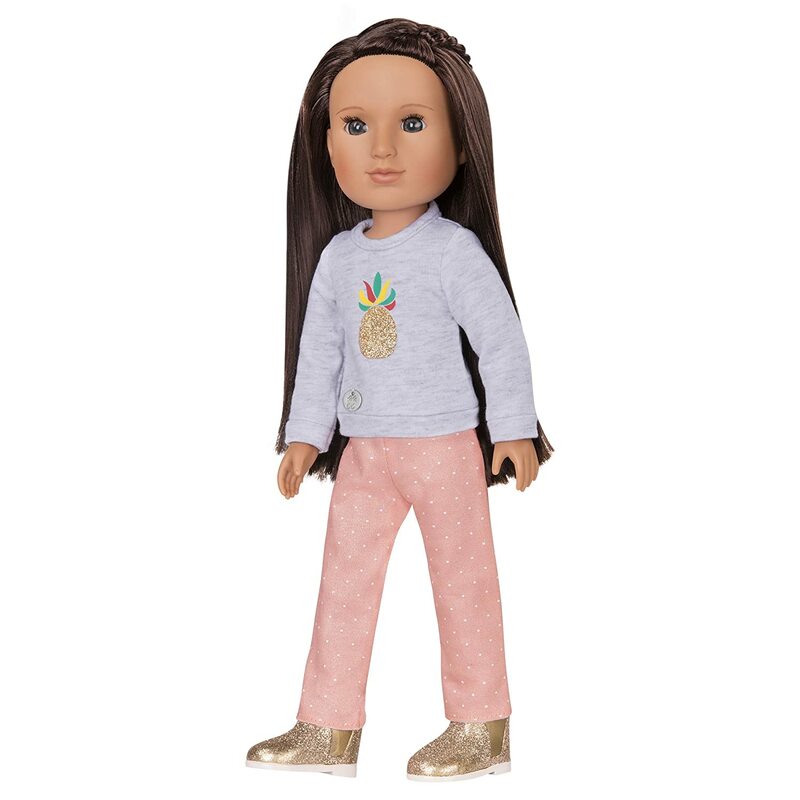 Glitter Girls are a unique brand of collectable 14-inch dolls with a variety of hair, skin, and eye color, who encourage children to be themselves, be positive, and have fun. 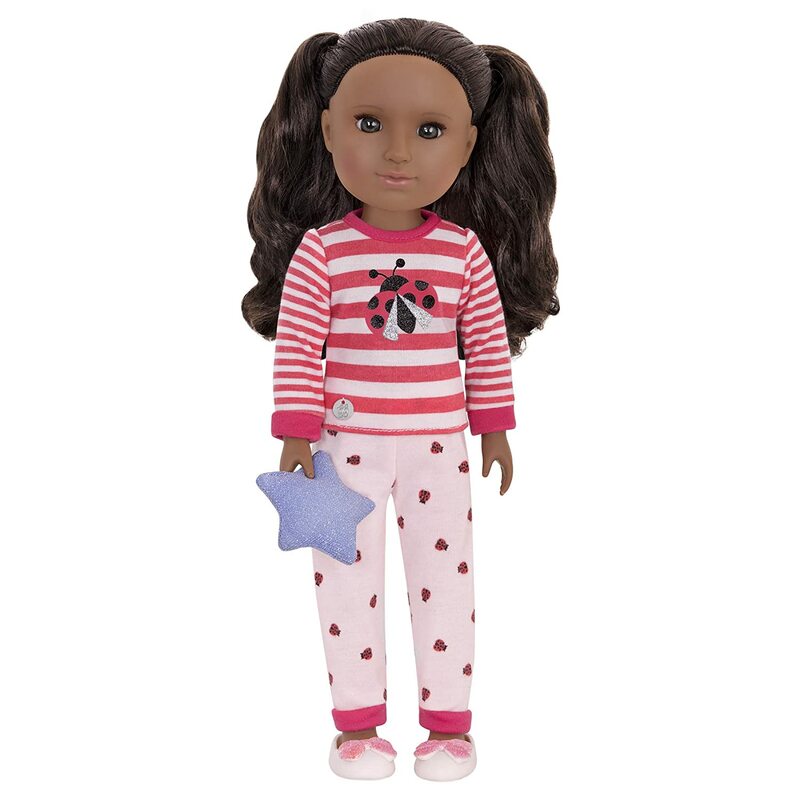 With bright ideas and a little imagination, Glitter Girls dolls enable your kids to "Stand out and be bright!" and to "Add dazzle to every day!" 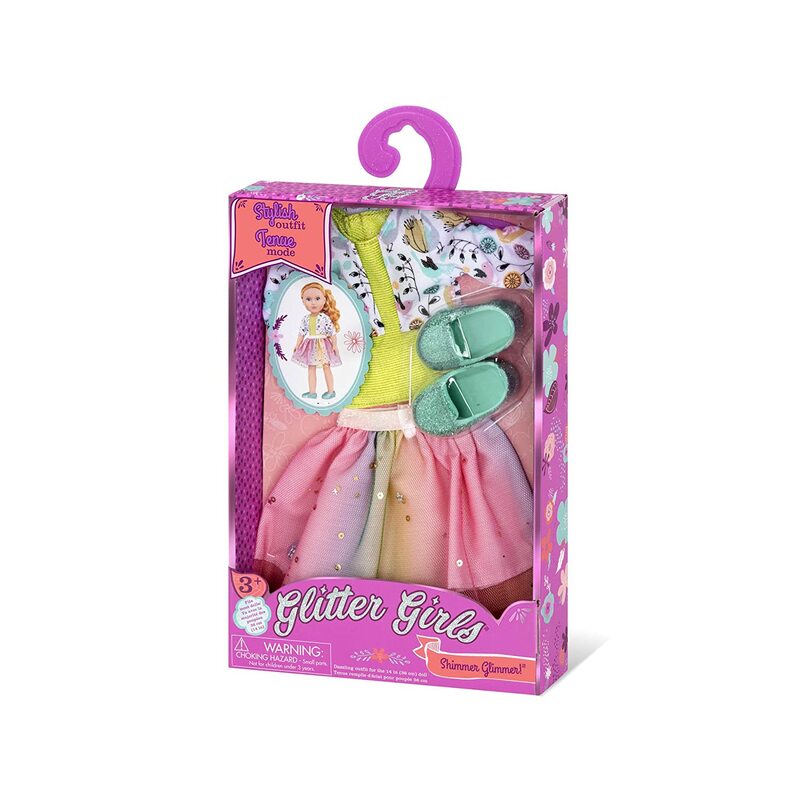 Every doll comes with a sparkly hair bow and signature glittery shoes. 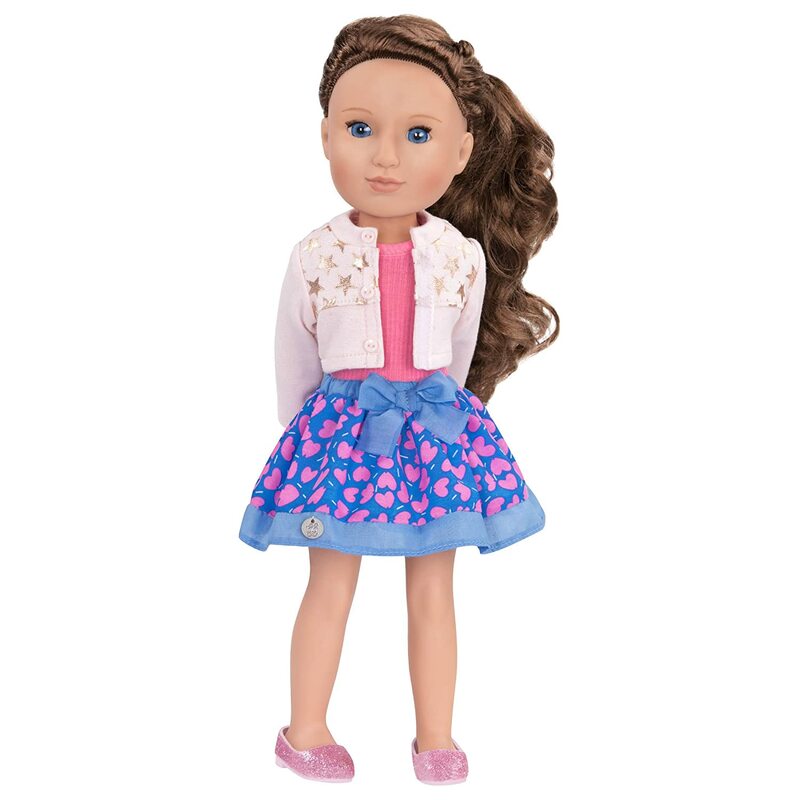 The 14-inch (36.8cm) doll is great for little girls who love fashion and, of course, glitter! The themes of friendship and caring promote exploration of healthy emotions and relationships, and provide children with the benefits of imaginative play. 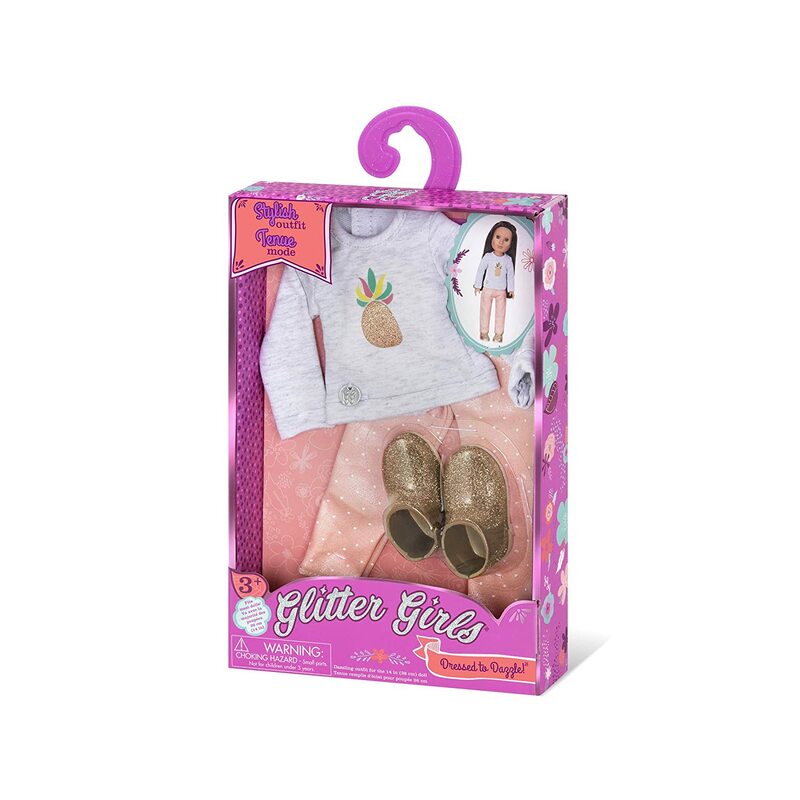 Glitter Girls are sized smaller than popular American Girl 18-inch dolls and can travel easily for added convenience. Their solid plastic-body construction makes them durable, easy to clean and care for, and long-lasting. Traditional Toys - Balancing Screen Time Toys play an important role in every child's life, and it is important to offer your children a variety of toys in order to help them develop healthy, curious minds. Traditional toys such as dolls and other non-electronic toys allow children to take a break from their time in front of screens while developing their imaginations and learning to interact with other children and the world around them in healthy and beneficial ways. Like many parents and educators, we believe in the importance of interrupted screen time for young children and we are proud to offer a line of toys for children that encourage these types of positive development for children in modern families. A Trustworthy Company Battat is a family-owned company established in 1897 that has grown bigger and stronger ever since. Today, we provide smiles and giggles in more than 62 countries. Battat is definitely here to stay! Childhood is a time to be bold and curious, and at Battat we aim to be there every step of the way. We offer a unique range of engaging toys for preschoolers, toddlers, and babies, all the way up to kids a little older. At Battat, we strive to think outside the toy box. We've partnered up with the WE Charity to give back, building villages and schools to empower children around the world. We are also eco-conscious and always try to minimize the impact of our products on the planet. This is what makes us stand out in this fast-paced industry. 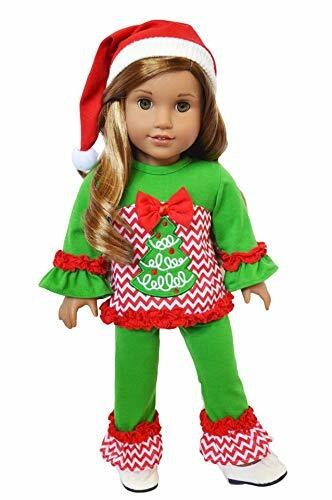 This was a gift for my daughteru2019s friend and she loved it; we got it for her American Girl Wellie Wisher and it fits great (she tried it on her doll after we gave it to her at her bday party). It does come with a pair of socks that are not mentioned in the item description, which was a nice surprise, but they do not stretch at the top and would not fit because of this design flaw. Very cute outfit and great value given you get a skirt, tank top, cardigan AND shoes. I think that the quality of the clothes is nice too (except the socks). The only other thing I would say is that the glitter on the shoes likes to u201cshedu201d quite a bit. 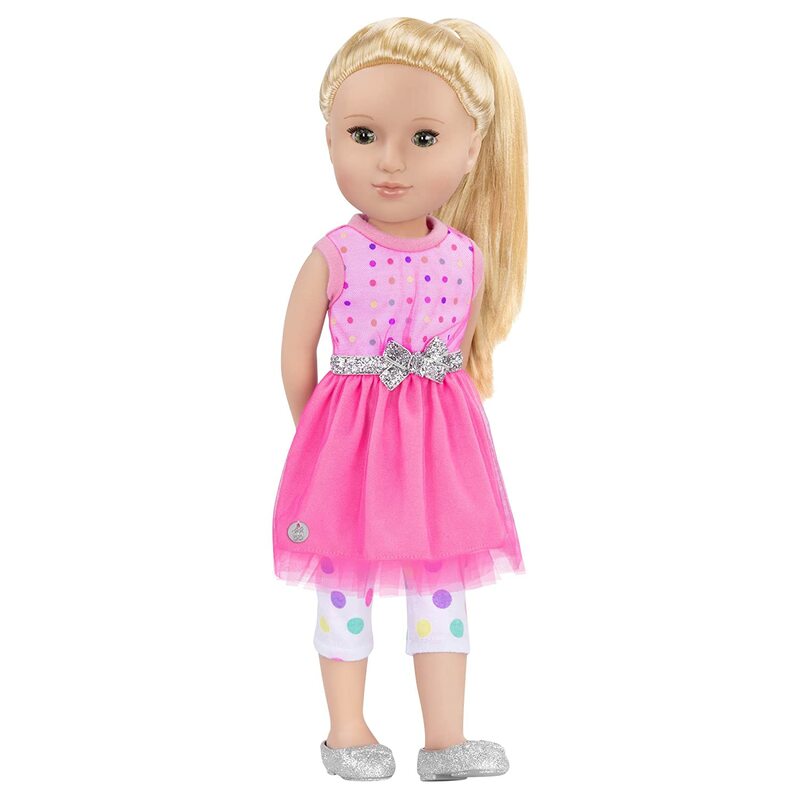 Overall, I would definitely recommend this for your Wellie Wisher Doll - itu2019s a great fit and value and alternative to the pricier AG clothes. 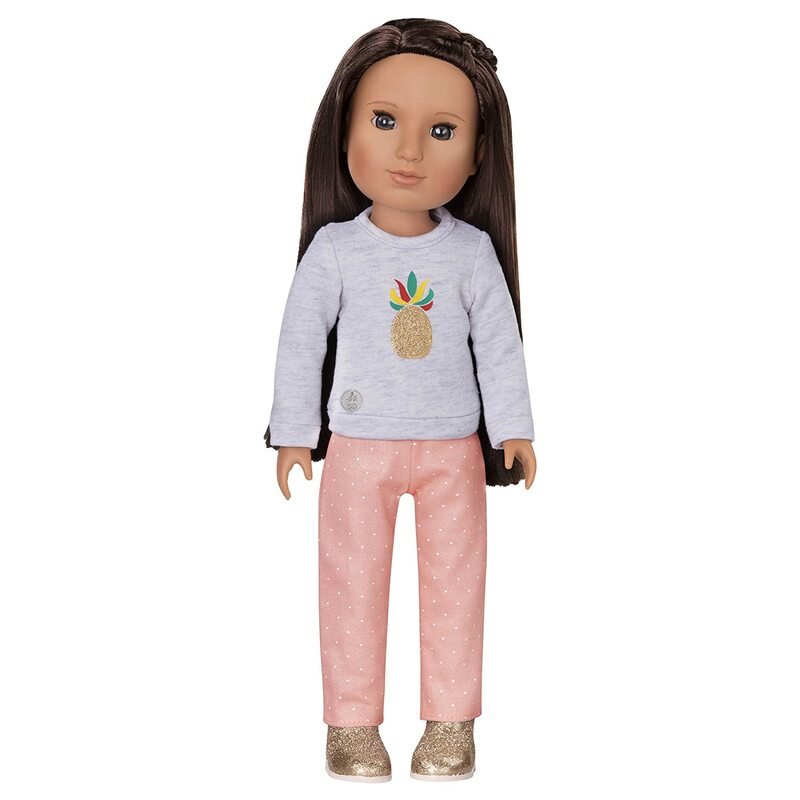 We bought this and four more clothing sets of the same brand for our 7 year old daughter who received these and a American Girl Wellie Wisher doll for Christmas. Our daughter was very excited to have the doll and cute clothes for her to change into. 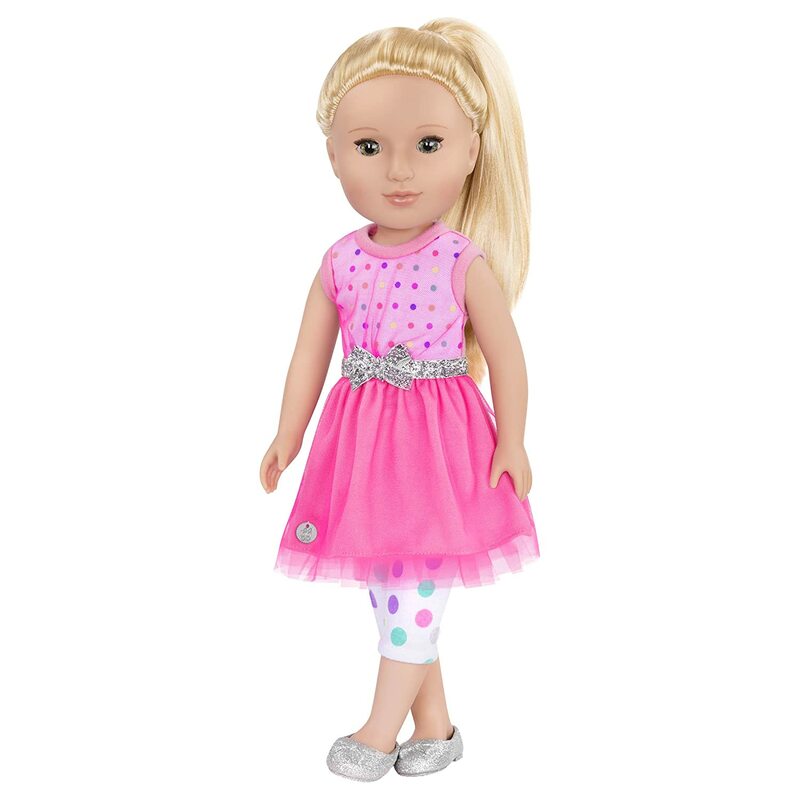 The clothes fit the Wellie Wisher doll perfectly. We are all happy with our purchases. 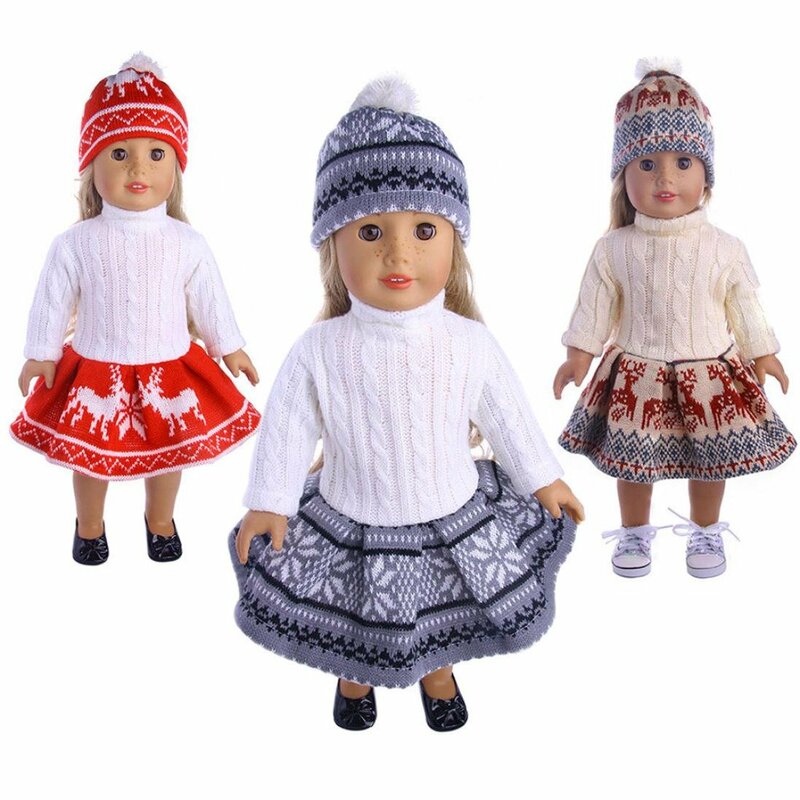 Bought these outfits for my daughters Wellie Wisher dolls. This one and the rainbow skirt one. They were on sale so figured I would try them out. They fit perfectly and are very well made. 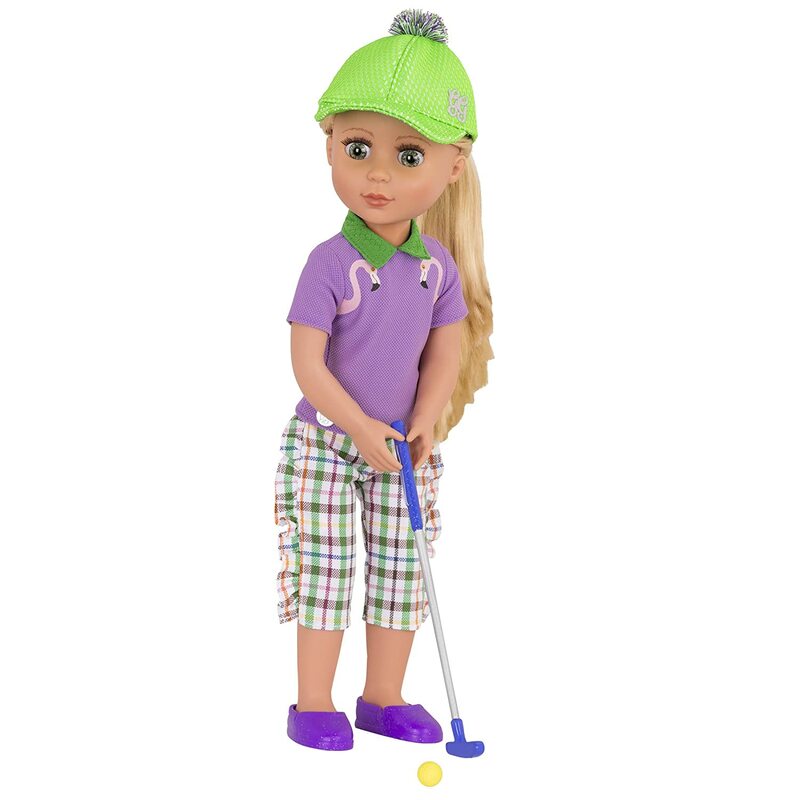 Actually purchased a couple of these outfits while on sale for my daughter's Wellie Wishers dolls. They fit perfectly and are really cute and well worth the price. Adorable outfit for my daughter's Wellie Wishers doll. It fits well and is half the price of the clothes sold by the company that makes the dolls. My only complaint is that the little jelly shoes don't stay closed, they have a little hole in which a small knob on the strap is supposed to fit in and keep the strap down, but it doesn't stay down. The shoes still stay on the doll's feet fortunately, but the strap hangs loose. This is such an adorable and well made outfit. This set seems made better than the one it came with. It is SO cute and fits the Glitter Girls perfect. It even comes with a fairly sturdy pink hanger! My kids love it so I do too. Iu2019m really happy with this purchase! High quality for the price. Would definitely buy again. Pleased to discover they fit American Doll Wellie Wishers too.